The Deputy Mayor, Cllr Liam Jones and his consort Michelle Carter represented Frodsham at the Cheshire West Community and Voluntary Arts Awards evening at Chester Town Hall on Tuesday. Guests were treated to performances by Little Actors Neston, KMTC and City of Chester Brass Band interspersed with awards presentations by the Lord Mayor of Chester. 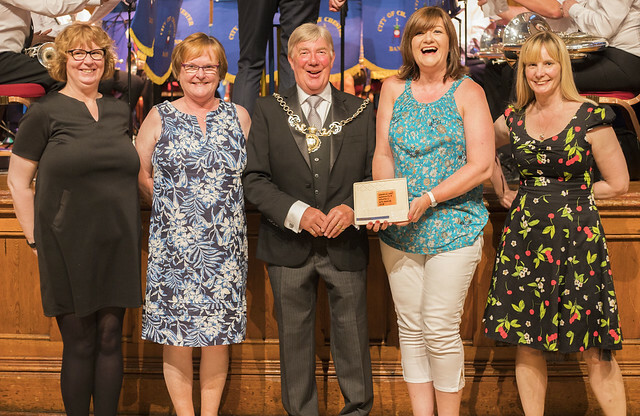 Cllr Jones particularly enjoyed supporting Frodsham Choral Society who were contenders for the Music award and Castle Park Arts Centre were contenders for the Unsung Hero award. FDCS is proud of its contribution to local communities over the last 48 years. It endeavours to bring choral experiences to new audiences and young people. It has performed concerts with local primary school choirs, participates in Frodsham Singathon and in 2009 commissioned an anthem for the 800th anniversary of the town. FCDS carol sing at supermarkets and care homes and have performed at WeaverWords Literary Festival. The Choir is available to weddings, funerals and helps to bring community events together. Castle Park Arts Centre occupies the former coach-house and stable within the Castle Park Estate in Frodsham. The Centre houses four galleries, a craft room, cafe and gift shop. It is typically open to the public every day between 10am and 4pm. The Arts Centre’s days are filled with workshops, lectures, tours of the exhibitions. It hosts Meet the Artists Open Evenings every 6 weeks, musical afternoons, jazz evenings, art fair days etc. Over the last 12 months there have been more than 80,000 visitors to the Centre.